I have always disliked the performance of the stock headlights. Some have reported success with switching to a relay and larger wiring to the headlights. I decided to use better headlights and do the relay upgrade at the same time. I purchased some AutoPal headlights from an Ebay seller. They are 165mm glass lamps that take a removable H4 bulb. I highly recommend the relay upgrade. You might want to do that first and that may be enough. I live in a rural area that doesn't have many streetlights. I am extremely pleased with the new lights. I used to struggle to see with the low beams and would use my high beams and fog lights but would have to turn them off when approaching oncoming traffic. I drove tonight with the low beams and didn't have a need for the high beams. First you will need a 5 pin 30 amp relay and preferably a relay socket. However you can use .250 female terminals instead of a socket. I prefer the one with two 87 pins and without the 87a pin. This way you can run 2 separate leads to the 2 headlights. You want the relay as close to battery as possible preferably and use 12 gauge wire for input and ground. Run 12v+ to pin 30. A 20 amp resetable circuit breaker inline with the + would be a good idea. Run a short ground wire to pin 85 and attach it to the body or another suitable ground. You will need another relay for the high beams if you wish. 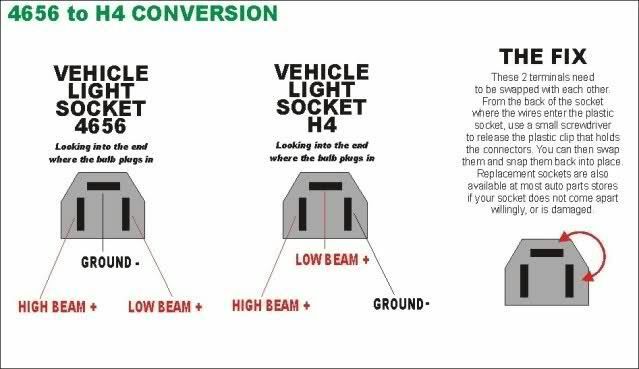 The H4 conversion bulbs use a plug just like the stock Eagle's plug, however the orientation of the 3 leads is different. I didn't want to cut or splice into the factory harness, so I just slid a .250 spade terminal into the low beam's female socket and that goes to pin 86 on the relay. That wire doesn't need very large since it is just a switch wire. I bought some new bulb socket pigtails and ran 12 awg wires from the 87 pins to the appropriate pin on the socket for the low beams. Run a ground wire to the appropriate pin for the bulb and you are good to go. Okay I got a question- I have the regular 4556 lights on my car and I noticed when I turn the high beams on the low beams go dimmer. Is that supposed to happen? Or does this mean my socket is H4 style? I had the same problem with the sealed headlights on my car. They were horrible, and I ended up doing an HID upgrade. It took a little bit more effort to get them to look stock [the lenses they came with were awful looking], but no one ever can tell until I turn them on. The difference was well worth it. I ended up going with 6000K lights, as they are pure white. You can get tinted light, depending on what K you go, but I found 6000K was the purist white, with the best visibility. Some charts list 5000K as pure white, but they aren't as bright. There is a very slight tinge of blue for the first 30 seconds - 1 minute before they warm up. Overall I was really happy with the upgrade. I think a headlight upgrade is one of the first thing's people should do on older car's. It's a pretty straightforward install. You should have no problem doing it. I personally noticed a huge difference and was super happy. One word of advice though. AIM THEM!. Even a millimeter too high and they can blind people. HID's have a bad rap for blinding people, but it's always misadjustment. Hey Sunny, I got the HID's in and they look great. Its getting dark here so its almost time to take them for a test drive. The only problem I have is that the main headlights go out when I turn the brights on. In a stock Eagle, there are two filaments in the outside headlights, and three wires that go to that unit. When the brights are off, the one filament lights up, fed by the light green wire. When you turn on the brights, the first filament goes out, and the second one turns on, along with the inner headlight (fed by the white wire). Since my HIDs are wired to off of the low beam, they turn off when I turn on the high beams. Need to figure out a fix for that. Did you have the same problem? Thanks. The kit that I got came from Pro Street Graphix on the bay site. It includes 4 housings, 2 HID bulbs and 2 ballasts, and then two H4 bulbs for the high beams. A true HID light requires the ballasts. My HIDs are low beams only. The problem I have to resolve is that the way the Eagle lights are wired, the low beam in the outside headlight goes out when the high beams (one in each outer and inner headlight) comes on. I tried a quick fix of tying the high beam feed to the low beam feed, but then all four lights are on all the time. I've got a couple ideas to try, involving the relays I also installed today. I'll get it done somehow. I will take some pictures once I get the high beam housings installed and wired up. I can't speak for what vangremlin and sunny used, but most of the cheap(affordable) HID kits i've seen for sealed beam headlights use fixed position bulbs, so no high/low. My dirt bike is street legal, but riding at night with the standard 35 watt bulb was kinda sketchy. Since it takes a standard h4 bulb I figured doing an HID conversion on it would solve the problem without having to modify the appearance of the bike. I had to do some searching, but I did eventually find a few sellers on the 'bay that had High/low capable HIDs. Since HIDs don't have filaments, they change high/low position by use of a reflector/shade around the bulb that is magnetically shifted like a solenoid. I tried a quick fix of tying the high beam feed to the low beam feed, but then all four lights are on all the time. I've got a couple ideas to try, involving the relays I also installed today. I'll get it done somehow. I'm not sure how your relays are set up, but if you can't figure out your low beam issue that way, you can also fix it with a couple high current diodes. Are you using one relay to switch the lights on/off, and a second one for the high/low? If that's how you did it, just put a diode in line with the jumper from the high to low beam on each side. It'll work like a one way valve to let the current flow from high to low, but not backfeed from low into high. Just make sure you get diodes capable of handling the current, to be safe I would use diodes rated for 10 amps. The HIDs should only be pulling about 5 amps each but the initial turn on current for them is higher until they warm up. There are diodes that will work for you listed on the 'bay for less than $10 shipped for a pack of 5. You'll only need 2 but it won't hurt to have extras. Search for "10A Schottky Diode" and you'll find 'em. Mine have high/low, but they are on a single lens. A buddy of mine did it on an Astro, I should ask him if he has high/low or just low. It has the 4 headlights like an Eagle. What Vangremlin said is right, true HIDs have ballasts. You see a lot of shops selling 'plug in HIDs' that are basically normal bulbs. Thanks for looking into those diodes for me. After it didn't work the way I wanted it to, I thought I needed a "check valve" (can you tell I'm a water guy lol) for the electrical current but wasn't sure exactly what I needed. The way I currently have them wired is one relay for the lows, and one for the highs. What I was thinking of trying is hooking the wire from the 87A terminal on the low beam relay to the power feed for the low beam lights. 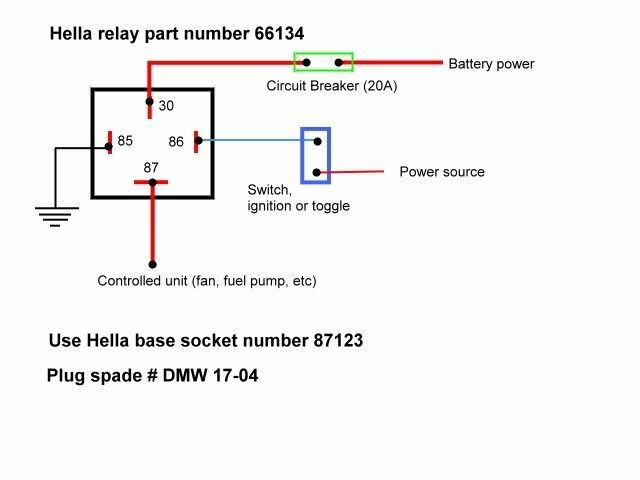 As I understand the relay, 87 has power when the switch is on, and 87A has power when the switch is off. But maybe that will send power to the lights even when the lights are off....maybe I need to do some checking first before I start splicing anything. If that doesn't work, I'll go the diode route. I was thinking I could hook up the hi-beam signal wire to the low beam relay, so that it turns on the low beams whenever the low beams or hi beams are on, and put the diode in that circuit. I was thinking I could hook up the hi-beam signal wire to the low beam relay, so that it turns on the low beams whenever the low beams or hi beams are on, and put the diode in that circuit. I've had a few beers tonight but as well as my brain is working right now, that actually sounds like a good idea, and won't rely on the diodes taking the full current of the lights. In that case, the 3 amp diodes radio shack sells would work fine. They don't exactly lend themselves to an easy install in automotive applications since they're typically installed on a circuit board, but it's not hard to make it work and look stock. You can cut off all but about 1/4" of the leads on both ends, and solder your jumper wires to those legs. then I use some fine gauge heat shrink over each of the legs, then larger heat shrink over the entire unit to keep any moisture out. They aren't going to be damaged by moisture, but water on any electrical connection will eventually corrode and cause problems. Like a check valve, if you install them the wrong direction you'll get undesirable results. One side of the diode will have a stripe around it, that side is the direction of flow. Make sure you mark which side is the side with the stripe before you tape it/heat shrink it. The side with the strip will go towards the low beam relay in your application. Thanks, I'll go ahead and pick up a diode and make that my project for this weekend. I am considering doing the "Crystal Clear" headlight conversion with the 55/60W bulbs. So the only thing I need to do to make them function properly is the switch the ground and low beam terminals on the plug? And do I have to switch all four plugs or just either the high or low?